Engage employees with smart apps and communities on Salesforce. Explore inspiring webinars, ebooks, demos, and more in our VIsitor Center. 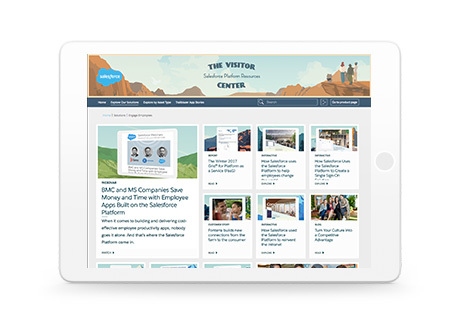 "Head for the Visitor Center to unlock everything you need to know about how to engage employees on the Salesforce Platform. Discover how to deliver an amazing experience to employees company-wide. Find all the resources you need, including interactive tours, webcasts, and videos, as well as real-life stories of apps companies have used to elevate employee engagement. Explore the Visitor Center now.